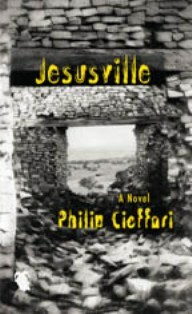 With a host of colorful characters forming its backbone, Philip Cioffari’s Jesusville explores those difficult and dark corners of the human experience: loneliness, self-doubt, and lust. All the book’s characters, similarly locked in desperate searches for some form of redemption, find themselves in a lonely patch of desert darkened by the shadow of the ruins of the Holy Land, a failed Christian theme park, its facades now eerily defaced. This desolate desert setting takes on a character of its own, and it is in this bleak, ghostly place that the characters of Jesusville must confront inner demons and very real external threats. In an almost electric anticipation, the novel’s action begins when Joseph Dillon, a man on the run from a drug lord in the Bronx, comes knocking on the door of the Catholic sanctuary at the Refuge of Good Hope, where a wary priest, Father Martin, offers the questionable Dillon a place to stay. Next enters Trace, a journalist hoping to find Zeke Farley in order to learn more about his father, Joshua Farley, a mystic who came to the region to harvest a plant said to help its user see and commune with God. His faith lost after a childhood trauma, Trace seems to be searching for Farley—and his mythical plant—as a last ditch effort to recover his faith. With Trace comes his wife Vee, a young, beautiful woman unsure of what she wants from life and unnerved by the Refuge’s strange air and occupants. These psychologically isolated characters meet at a pivotal moment, more connected, perhaps, than they can realize. Dillon, knowing his life is at stake after losing a large shipment of drugs, begins a frantic search for the legendary plant said to be the ultimate drug, his last hope to gain forgiveness from his vengeful boss Vinnie and buy back his life. Trace soon begins his own search for Zeke Farley and the plant that just might have the answers to his questions. Meanwhile, Vee and Father Martin search their souls, Vee trying to tap into an artistic, powerful part of herself she fears is slipping through the cracks and Father Martin questioning his heart, coping with his doubt about his capacity for love. As the novel unfolds, it brings these searching characters in their mounting personal crises together and pits them in a mutual, climactic crisis. Jeremy Dunn lives and writes in Waldo, Alabama.